GeoSonic is a true all-in-one hydrographical survey solution with a multitude of functions. Depending on the connected sensors GeoSonic will function as a dual frequency echo sounder, a portable side scan device or a magnetometer survey system. 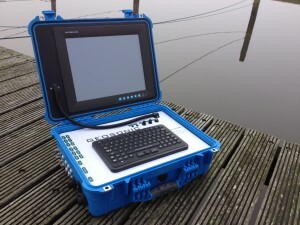 The system consists of an internal industrial PC with a 15” touchscreen LCD and a watertight keyboard and pointer. Based on our successful GeoDredge hardware and our Viking Survey software, it provides the perfect solution for a wide range of hydrographic challenges. An (RTK) (D)GPS Compass is fitted internally along with internal UHF transceiver and GSM/UMTS modems.